The toughest one-step metal coating! Zero Rust is a direct-to-metal, phenolic modified-alkyd rust and corrosion control coating which puts down an impermeable barrier at the steel level. It is chemical, heat, and abrasion resistant, thus providing superior rust control. Under ASTM-B117 salt spray testing, Zero Rust exceeded 2000 hours of continuous salt spray at 3.5 mils dry film thickness (dft). This equates to 600 hours per dry mil, which was previously unheard of in an air-dry system. As a rule of thumb, Zero Rust should provide five years protection for every 3 mils dft, given proper surface preparation. With the addition of a topcoat or a thicker film of Zero Rust to handle ultraviolet rays, sealing protection can easily double. Zero Rust can withstand intermittent temperatures of 250-300 degrees before the resin starts baking out. Maintenance of a Zero Rust paint job is easy – just scuff surface with sandpaper before re-coating. Provides maximum adhesion to steel – this is called chemical affinity. Extraordinary dielectric ability – steel is isolated from the electrolysis process which converts steel to rust. In laymen’s terms, this means that if you can starve the oxygen from the substrate, oxidation (rust) cannot occur. Zero Rust is a fast-dry coating which dries to the touch in 30 minutes and is tack-free within one hour, depending upon relative humidity and temperature. NOTE: Drying time can also be affected by film thickness, flash-off time between coats, amount of thinning and air movement. Love this paint. It's durable as heck. We use it under all of our plow trucks. (2) For conditioning clean metal surfaces (prior to painting), dissolve 6 ounces of Prep Step in 3.5 gallons of preferably hot water and spray on clean surface with spray bottle or garden-type pump sprayer. Let Prep Step solution dry thoroughly on metal surface before painting – DO NOT rinse with plain water. (Note: this step will prevent flash rust from forming on metal surface for up to 30 days, depending on temperature and humidity conditions, so immediate painting is not necessary). (3) For power washing, dissolve 24 ounces of Prep Step in 10 gallons of preferably hot water and spray at 3000 to 4000 psi. Ideally, for best performance, metal surfaces should be prepared using Prep Step. If this is not possible, surfaces must be thoroughly cleaned of any dirt, oil, grease, silicone or any other contaminants. As with any paint product, a straight line relationship exists between surface preparation and product performance. (1) New Steel (mill scale) – It is recommended that mill scale be removed prior to coating with Zero Rust. If left intact, any mill scale will become the weak link in the system; where the Zero Rust film may become broken, rust will move sideways between the mill scale and the substrate. (a) Remove loose scale and powdery rust and minimize pits. Minimizing air entrapment in the substrate is key. Leave no oxygen behind in the substrate to continue the rusting process. (b) The smoother the surface and the tighter the resultant rust, the less product will be needed to span the highs and lows to achieve the 3.0 to 3.5 mil coverage. (3) Partially Rusted, Partially Painted Surfaces – When repairing a deteriorated painted surface, total removal of old paint is preferred. When this is not feasible, treat as you would mill scale from the standpoint that the old paint becomes the weak link in the system. The cleaner, tougher and tighter the old paint can be prepared, the better the resultant job. Pay particular attention to paint edges that lift and curl. 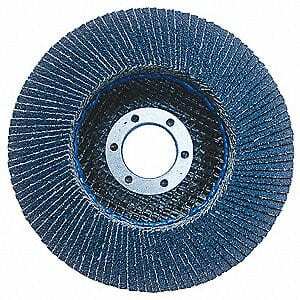 For best results, use a rotary sander to feather out exposed steel to adhering paint edges. (4) Aluminum – For corrosion protection on aluminum, follow industry preparation standards for cleaning, etching, etc. CAUTION: If aluminum is cleaned with Prep Step, hydrogen gas may be produced. Take proper ventilation and flammability precautions. (5) Aged, Rough Galvanized Steel – Zero Rust will bond to galvanized steel with the addition of one tablespoon of dry Portland cement per gallon Zero Rust. Half a tablespoon of high calcium hydrated lime may be used in lieu of the Portland cement. Mix thoroughly. Follow general instructions for cleaning. (6) New galvanized steel – For new galvanized steel, use a vinyl wash primer before applying Zero Rust. 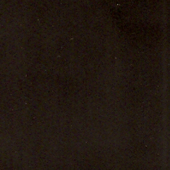 The dry mil thickness of the primer should not exceed ½ mil. Lacquer thinner or xylene is recommended for clean up of Zero Rust and xylene is recommended for the clean up of Crystal Coat. When closing bulk containers of Zero Rust for later use, pour a ¼” layer of thinner on top of the paint before closing the lid. This will stop skin from forming during storage. Dispose of wastes and residue in accordance with regulations applicable to the area of use. Mix Zero Rust well before using. Apply with spray, brush or roller. 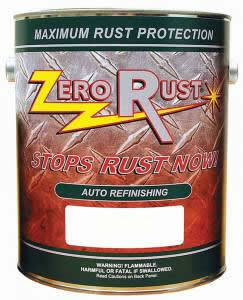 Zero Rust is a high solids product with 54% solids by volume. For practical purposes, 2 mils of wet film yields 1 mil of dry film thickness after solvent evaporation. If Zero Rust is thinned prior to application, additional wet film thickness must be applied. For best results, apply a minimum of two coats, using a crisscross pattern from one coat to the next to help preclude holidays (pin holes) and thin spots. To assure adequate coverage, an easy visual barometer is to use two dissimilar colors for the first and second coats – i.e., a coat of red oxide followed by enough of the final color to hide the red oxide. NOTE: Red oxide and black are the best of the best for sealing. Thus, we recommend either of these colors as the first coat. Do not apply too heavily and allow adequate time between coats for flash off; 20 to 30 minutes is typical. This is extremely important! Because Zero Rust is formulated to be impermeable to oxidation, the surface of the film starts closing when the solvents start flashing off. This impedes the migration of solvents from the interior of the film. When a thick coat is applied, or if adequate time is not allowed between coats, the paint takes much longer to dry. Because Zero Rust is heavy bodied, thinning will be required for siphon gun application – a reduction of 15-20% with xylene is typical. Recommended thinners are Xylene (Xylol), Toluene, and Acetone. Do not use mineral spirits or VMP Naphtha for thinning. Zero Rust meets the current volatile organic compounds (VOC) limits for architectural coatings (AIM), as published by the EPA on 9/11/98. For these customers who fall under the AIM category, thinning must be done with an EPA-approved solvent, such as acetone or Oxsol 100. Application with airless spray equipment can be done directly from the can with no thinning; however, a thinner may be required at temperatures below 60 degrees. If necessary, you may thin to suit for brushing and rolling. NOTE: Zero Rust is not recommended for submersible applications.